Winter in New Hampshire is a magical time of year. Snow-covered trees, frozen ponds and great outdoor fun for skiing, skating and snowboarding abound. But winter weather can also make NH roads treacherous. Snow, ice and frigid temperatures can make it difficult, if not impossible, to travel. Statistics show that there are over 1.5 million weather-related car accidents every year. Many of these collisions were caused by drivers that failed to proceed cautiously while driving in bad weather. 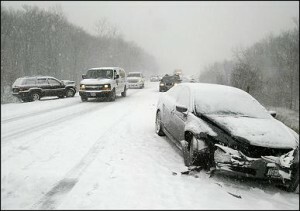 According to the U.S. Department of Transportation, 24 percent of all annual crashes are weather-related. All drivers have a legal obligation to drive safely. Winter weather is a factor that must be considered when you head out on the roadways. Consider the weather conditions, including snow, ice, freezing rain and slush. Increase your breaking distance and reduce speed accordingly. Antilock brakes will help pavement sliding and skidding, but they will not stop like they do when driving on dry pavement. Falling snow, freezing rain and sleet all decrease a driver’s visibility, so take these factors into consideration. Drivers who fail to recognize the hazards of winter driving put us all at risk. ASSIST ANY INJURED & PROTECT THE SCENE – If any person is injured, immediately call for a doctor or ambulance. Do not try to move the injured person. This could cause more injuries. If possible, try to warn oncoming vehicles in order to prevent further accidents. CALL THE POLICE – Call the police immediately so an official accident report can be filed. Unless you are injured, remain at the accident scene and cooperate. DO NOT MAKE A STATEMENT – Do not make any statements, oral or written, to anyone except the police officer. Do not admit or sign anything, even if you think you are at fault. TAKE NOTES – Take notes of all significant details concerning the accident. Physical evidence, including position of cars and length of skid marks, will be useful if you are sued or if you decide to sue someone else. Save these notes for your attorney and do not share them with anyone. RECORD WITNESSES – Write down the name, address and phone numbers of any witnesses. Witnesses may have important information about the accident. SEE YOUR DOCTOR – Have a physician examine you as soon as possible. Ask any passengers to do the same because an accident can be the cause of serious and costly future health problems. CALL YOUR LAWYER – Contact your lawyer as soon as possible. Your lawyer should assist you in handling legal and insurance problems associated with the accident. CONTACT YOU INSURANCE COMPANY – After consulting with your attorney, report the accident to your automobile insurance company. This report should follow your initial report to your attorney on the day of the accident. PAY NOTHING – Do not make any payments to the other party involved in the accident or promise to make any payments. Tenn And Tenn, P.A. is a trusted New Hampshire injury law firm. Our auto accident lawyers have years of experience handling car accident and injury cases. We are committed to providing outstanding legal results for every client and strive to obtain the maximum compensation possible for them. If you or a loved one has been seriously injured in a NH car accident, please fill out a free case evaluation form on this website, or call our office today for a free and confidential consultation. At Tenn And Tenn, we are committed to providing outstanding legal results for every client we serve. We offer a free consultation to those injured in car accidents. If we take your case, you do not have to pay us any legal fees unless we succeed. We take our fee at the end of the case and only if we are successful on your behalf. If you would like to schedule a free consultation with one of our attorneys, call us today at 603-624-3700.